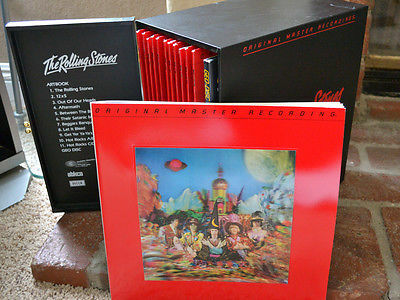 This is a Rare Mobile Fidelity Sound Labs (MSFL) numbered box set of the Rolling Stones.LIMITED EDITION# 1290 / 10,000and is long out of print. It was pressed 28 years ago. The MSFL Japanese pressed LP box set is an 11 LP collection and is pressed on Super Virgin Vinyl [so pure you can hold up to a light and see thru] JVC half speed pressing This box set recording is from the Victor Company of Japan and Mobile Fidelity Sound Lab, the innovator in the production of stat-of-the-art audiophile-quality sound recordings. Special static free- dust inner sleeves and special heavy duty protective packing. These sets will never be made again, truly a collectors item. The box has a slight ding and some wear on the top corner and some of the outside sleeves are worn, but all thevinyl albums are in MINT condition. MFSL LIMITED EDITION. This limited edition box set is an audiophile collector's item that simply gives the feeling of being directly in the studio with the artist. Made with nothing but the finest lacquers. The more you play the LP, your stylus will polish the grooves and actually improve the audio of your LP. The recordings are mastered from the original session tapes. A SONIC WORK OF ART. These out of print gems are the FINEST/RAREST of the audiophile LP market. The future of these collectibles is so exciting because each piece is a sonic work of art that will never be reproduced using this state of the art proprietary technology, high quality ingredients and attention to detail from beginning to end. The depth and dimension of the music is delivered back to you with all the dynamics and richness of the live recording session. With Mobile Fidelity, you will come as close as possible to hearing the three-dimension quality of the music just as the artist intended it to be. Also includes rare Art book with 3D Lenticular Cover, Rolling Stones-Unseen Archives, and liner notes. For International Shipments, buyer is responsible for anycustoms, duty and / or fees. NOTE: LAST CALL! Will be taking this item off the market for sometime so if interested please make me an offer. I will consider any reasonable offer! !